There's something refreshing about the prospect of seeing a play set in a foreign location. Let me rephrase that, a play that isn't a living room. Set in the communal room of a research base in Antarctica, Jona Tarlin’s In Antarctica, Where It Is Very Warm, explores the darkness and loneliness of the frozen tundra and the workers who try to survive it and each other. In Tarlin’s new play, Neil, a replacement plumber, is brought to Antarctica to work on a research base as winter arrives on the frozen desert. As he becomes acclimated with his new home and coworkers, sanity quickly fleets and lives are tested. 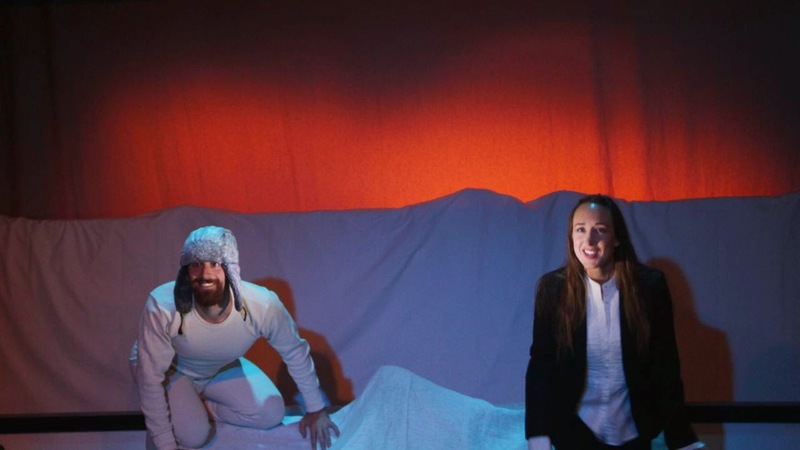 On the surface, In Antarctica, Where It Is Very Warm is an intriguing play about relationships and solitude. With a colony divided by scientists and blue collar works intertwining, lines are drawn as they attempt to survive the elements and each other. The characters that Tarlin has created seem to lack depth and dimensions. This may be due to the largest problem of the play, the timeline. Since the play is broken up into short scenes that take place over a seemingly long period of time, the individual character arcs seem to be lacking in the grand scheme. With Neil as the audience's way into this world, his character’s arc is developed on stage, but having only little backstory to lean on, the other characters lack their own personal journey. For the most part, the play lives in a very naturalistic world. That is until pregnant research student Vicki has a dream of premonition proportions. With no build up to speak of, the dream, though staged stunningly, seems to come out of nowhere. Had an insanity-driven dream occurred through the mind of Neil, perhaps it could be rationalized, but as it stands now, it appears a bit out of place. The overall pacing of the show is slow. Until there is some action, the majority of the performances are subtle and lack energy onstage. Christopher Norwood as Neil does a fine job as the plumber on the verge of a breakdown. Norwood and Lindsey Austen’s pregnant Vicki have an interesting will they-won’t they relationship, ultimately leading to an unlikely ending. On the opposite side of the chemistry spectrum is Veronique Hurley’s Annabelle and E.J. An’s Helen. Hurley’s performance is one of the strongest on stage. An’s Helen, who spends the majority of the play with the moral dilemma of whether or not to deliver Vicki’s baby, lacks all chemistry with Annabelle, raising the question of why these two. Rounding out the ensemble is the misplaced Anthony Perullo as Tom. Tom seems to be the player of the base but he has no one to play off of, with the exception of the girl who would never go for him. Director Kyle Metzger does his best to keep the world moving and accessible despite the lack of momentum in the script. The passage of time may have been the biggest downfall of the piece. With the facts the script offers about darkness in the winter months, it was rarely reflected in the overall design. Patience Haskell’s lighting seemed to lack darkness through the massive window of Aaron Ethan Green’s set. Sure, portraying darkness in a theatrical setting can be difficult as it is important to see the actors, the sanity-testing stakes set forth in the script were weakened with what was presented outside the window. With that being said, the dream sequence was a complete win for all involved. The sterile feel of Green’s set evoked the disheartening place to spend a life. In Antarctica, Where It Is Warm was filled with potential but did not live up to it on stage. The script may be better served in a cinematic medium where the perils of the locale can be explored properly.